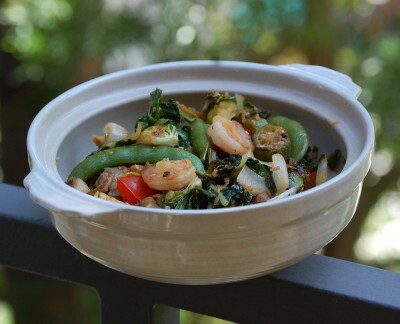 The other day I made a great stir fry for lunch – shrimp, snap peas, Brussels sprouts, okra, red peppers, bok choy, and maybe some other things. And so was this (different angle though)… Which do you like best? I sauteed everything in a fair amount of sesame oil, added some garlic and chili powder, and ate it after it cooled. One of my weird food quirks is that I don’t eat anything super hot or super cold. I like to cool my food in the freezer before I eat it, and if I’m eating ice cream or froyo, I let it melt first or I zap it in the microwave for a few seconds to get it soft. If I had that many apples, i’d finally try your macrobiotic apple pie that I have been dying to taste! Looks like you and Bobby had a great day–thanks for sharing. Sending you much joy in your apple baking adventures! 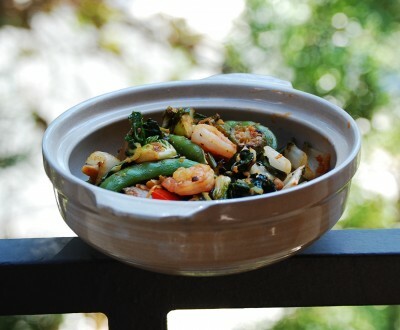 What a wonderful looking day AND stir fry! 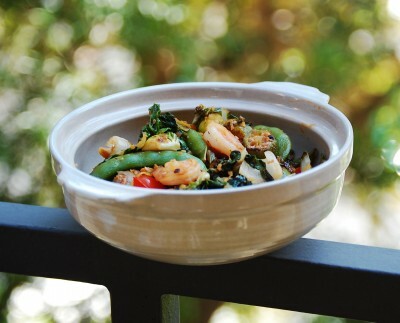 I like stir fry pic #3 the best…and all of your apple picking pics look great! That was quite a balancing act with the stirfry bowl-risky move with such delicious stuff. I’d try something savory with the apples, that soup sounds wonderful. Maybe cut them in half and bake with oatmeal and raisins? I could probably eat them all! But I might try those oatmeal applesauce pancakes, mmm!! Or some baked apple dessert.. I CAN’T WAIT TO GO APPLE PICKING!!! My husband won’t eat anything too hot or cold either! He always puts his meals in the freazer for a minute to cool them off! Looks like you had fun apple picking! I love your ideas! Anything with brussel sprouts get my attention!! YUM! Girl, I have a great recipe for a healthy apple bake. I will have to email it to you. So many great things you can make. Muffins, bread, pies, smooshed apples served with pork, sweet potato and apple casserole, or mashed sweet potatoes and apples, I could go on and on for ever…. Pictures look great! I’m wanting to get a new camera…what kind do you have/recommend? I love apples tool; they are easily my favorite fruit! I would make apple sauce and apple cider. I like the 3rd photo best! With that many apples I’d be making apple bread, applesauce, and apple crumb pie. I like the second picture best. juice! JUICE, and apple sauce and cobbler. LOVE apples! ESP this time of year. you are so beautiful and look so happy and relaxed picking apples with Bobby! I would eat them a loooot. Just fresh. But I would also make tons of applesauce, some apple muffins or a pie definitely. The pictures are just amazing! What a fun day! Hmm, well I have 6 lbs of organic apples in the fridge right now, and am asking myself that very question. So far, we are just snacking on them, so I will have to get back to you on that! Beautiful pictures! I just love your camera… is it a Digital Rebel? I like the 3rd pic! Apple picking looks SO fun!! I wanna go! I just can’t get enough of those gorgeous pictures! I really need to get an SLR sometime (not now, college student here, haha!). I would definitely eat a lot of those apples just plain for sure 🙂 Hmmm, I love a good apple crisp! Or fresh applesauce, mmm! I wouldn’t make anything…they would be gone in a week! Your pics look great! I need a new camera… I like to core the apple, pour a little apple juice over it, and bake it for a few minutes… so good! i think i liked the last pic best…. apple pie, applesauce, apples in my salad and oatmeal – i love apples! What fun! There are orchards in Watsonville?! Thanks for sharing. I was looking into going apple picking in Apple Valley but the idea of driving 3 hours one way didn’t appeal to BJ. I told him there would be apple bear once we arrived though. Still, not interested. Did the orchard sell pies or any other apple goodies? This sounds like it would be a lot easier drive than to go to Placerville. I love stir fry. I agree with Coco, the secret ingredient is sesame oil. So fragrant and tasty. I love the last picture of the stir fry!! ohhh…apples! i so need to get home so i can go apple picking before it’s all over!!! and i would make my mom’s (very sugar laden) applesauce cake recipe, passed down from my grandma…such a great cake!!! and that stir fry looks great too! I think I liked Picture #2 the best, and I so want to go pick apples…I’ve been eyeing the HoneyCrisps at Whole Foods, but they’re $2.99 a pound. No way! If I had endless pounds of apples, I would make homemade applesauce as well as your macrobiotic apple pie. CD loved that recipe! CUUUUUUTE maggie! as for your stir fry picture…i like the first one. the bowl isnt too bright but the food is a good density and the attention is on the food, the brighest spot. the angle is best for the food IMO. what kinda apples did you get? I want to go apple picking! 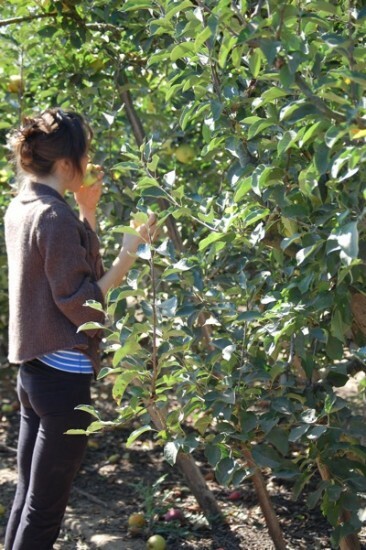 Unfortunately Texas is not really known for its apple orchards…. :\ But the asian supermarkets here have the most enormous (think small melon sized) apples! So I”ll have to make due with those. And lots of apple pie oats of course. Wow Maggie!!! Your photos are sooo gorgeous!!! I miss reading your blog! Oh school! At least tomorrow is hump day right? That stir fry looks amazing!! I spy cute little shrimpies!! Yum! I don’t like my cold food very cold, because I’m almost always freezing….but my hot food needs to be hot hot!! That’s a really cute quirk though!! Yay for apple picking!! I love that sweater by the way!! So cute. Looks like you guys had a great time apple picking. I REALLY should do this sometime soon… being in New England and all, there has got to be some good orchards around here somewhere! Aww, look at those bees chowing down! Gorgeous photos. I can feel how beautiful a day it was!